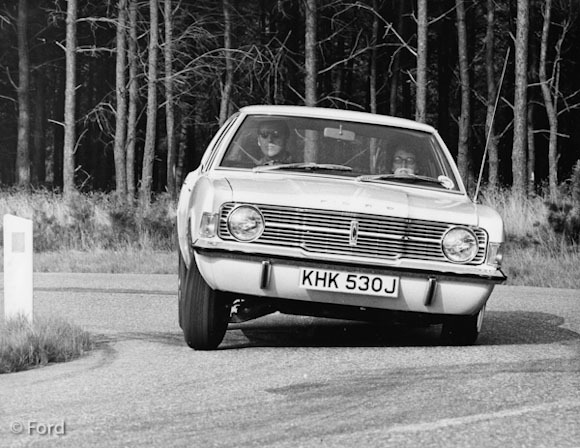 This month the Ford Cortina celebrates its fiftieth birthday, and drivers and enthusiasts around the world are gathering in large numbers to join in the festivities. There will be few people in the world where Fords are sold who have not been touched, in some way, by the irrepressible Cortina. My next association with the Cortina came in the late-70s when a friend’s father arrived to drop my friend off at University in his 1.6-litre Mk III Cortina pick-up, or as we called it in South Africa, a ‘bakkie’. Over the years that followed, my friend’s father left us his Cortina bakkie to transport antique furniture that we had purchased for his business at auction sales during our missed lectures, and to deliver this to his furniture storeroom nearby – what you don’t do for friends! They also owned a red Mk III Cortina 1.6-litre L saloon, which I used on one occasion to ‘rescue’ a bunch of stranded Primary School kids who had been on a school trip when their bus had broken down. As I boarded at the school at the time, I received a frantic call from the school master at 04h00 one morning requesting help, and this was during the years of fuel rationing in South Africa, and so I had to ask my friend if I could borrow the Cort’na to carry out this mercy dash as my car was all but out of fuel. I managed to get the old red Cort’na up to 100mph, I was quite impressed. A couple of years after leaving university, it was my turn to buy my own car, and having experienced the practicality of Ford’s Cortina range, I sought out a good condition Mk IV 1.6-litre Cortina, and yes, it was a bakkie. In fact it was this blue bakkie that caught the eye of a young lady who was in my life at the time, and after 27 years of blissful marriage and two wonderful children to show for it, I can happily say that the lovable Cortina bakkie has played an important and unforgettable role in my life. On a less emotional note, the Ford Cortina was manufactured between the years 1962-1982, and during that time it sold almost 4.3 million units, of which more than 3.1 million were produced at the Ford plant in Dagenham, Essex. Countries producing their own Cortinas locally from kits provided by Dagenham included South Africa, Australia, New Zealand, Belgium, Ghana, Ireland, Malaysia, Malta, the Netherlands, the Philippines, Singapore, South Korea, Taiwan, Trinidad and Tobago and Turkey. In fact, so successful was the Mk III Cortina in South Africa, that Ford built a dedicated plant in the late ‘70s near Port Elizabeth to handle the rampant demand for the ‘Big Six’ Cortina which in that country was powered by a potent 3.0-litre V6 engine. You could buy the standard 1200 saloon for £573 in 1962 while the last model to be produced retailed for £4,515 in 1982. The Cortina Mk I was immortalised by Jim Clark when he notched up countless saloon car and rally victories, notably the British Saloon Car Championship and the East African Safari rally, both in 1964, driving the Colin Chapman developed, and potent, twin-cam Lotus Cortina. For the observant amongst you, the Mk I Cortina starred in many movies and TV series including, Carry On Cabby (1963), The Big Job, The Knack and How To Get It. The Mk II Cortina was used in Billion Dollar Brain (driven by Michael Caine who didn’t have a driving licence at the time), as well as The Benny Hill Show, Bless This House and the nation’s two favourite cops ‘n robbers series, The Sweeney and The Professionals, while a Mk IV Cortina even appeared in the Bond movie, The Spy Who Loved Me. We congratulate the Ford Cortina on reaching its half-century, and wish her everything of the best for the next fifty!